Boots Denim Blue T-shirt Denim Blue, 100% cotton, short-sleeved t-shirt with Cedarwood Road design printed on the front and logo on the sleeve. No Line On The Horizon Navy T-shirt To celebrate the 10th anniversary of the release of No Line On The Horizon. 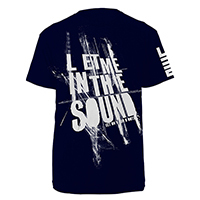 Navy, 100% cotton, short-sleeved t-shirt with Let Me In The Sound design printed on the front and logo on left sleeve.